Whether you are a patio or full-fledged yard gardener, you cannot help but notice that biodegradable plant containers are here to stay. 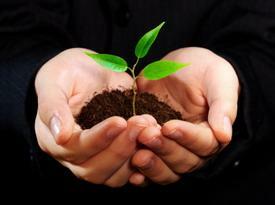 They offer a better growing environment and thus a better rate of success for growing healthy plants. They are great for the rest of the environment, as well as your wallet. Biodegradable Plant Containers - What Are They? For many years, the primary packing system for seedlings, are plastic packs of four to twelve containers. The plastic is petroleum based in makeup and automatically makes them a disposable, but not biodegradable product. Nor are they the best way to guarantee that all the plants you purchase would survive and grow. Despite drainage holes, these containers promote root rot through poor air circulation and often many of the plants in these packs do not survive. Enter the biodegradable plant container on to the gardening scene. Some manufacturers of these plant containers such as Fiber Fertil Pots® consist of wood fiber and peat moss. No drainage holes are necessary and the pot disintegrates into the soil. This prevents the necessity of even removing the plant from the pot when planting, also preventing plant shock from happening. The chances of the plant suffering from a change in soil temperature, and its receptiveness in a medium ready for water and additional nutrients improve dramatically. 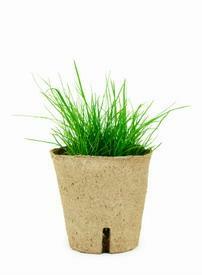 Bonnie's peat pots are 100% peat moss, while their jumbo fiber pots are made of recycled paper. Bonnie plants are sold through large commercial home improvement and gardening stores. Like their competitors, Bonnie pots are biodegradable, although the company recommends, tearing the bottom of the pot before inserting it into the ground. In Europe the Fiber Fertil Pots® are marketed as Dot Pots®. These pots are available for professional greenhouses and farms, and sold to the home gardener as well. An equally interesting fact, according to their website, is that the actual manufacturing of these garden pots are greener as well. Wood fibers come from trees thinned from sustainable managed forests. Electric power used in the manufacturing process comes from renewable energy resources, and packaging is broken down and recycled by the purchaser. In contrast, Bonnie Plant Farms, headquartered in Alabama, maintains an actual recycling center at their headquarters to recycle everything from plastic containers to peat containers. Rush Creek Growers, Inc., who supplies plants through the Mid-West portion of the United States, uses containers made from rice hulls, bamboo, and a water-soluble binder. These containers are useful for up to eighteen months and their remnants removed to a compost pile after that time. Some states such as Minnesota have a recycling program whereby customers can return plastic flats and pots to certain designated spots for a limited time, where they are then recycled. Even keratin used from recycled chicken feathers is used in the manufacture of biodegradable pots. As a protein used in binding, it helps nourish the plant and aids in the pots break down over time. The short answer to the question if all garden pots are biodegradable is no. The ever popular baskets made out of coconut fiber, as well as other pots manufactured in other countries and deemed biodegradable, may include glue, straw, and other chemical binders that are not totally plant or earth friendly. As a consumer and a gardener, it is important to use the most biodegradable pot and containers one can afford. The good health of your plants and of the earth depends on you. There are numerous resources and how to sites encouraging to the do-it-yourselfer to make your own biodegradable containers, or at least recycle common containers to use as plant starters. Some of the most popular materials to use include newspapers, eggshell containers, and cardboard tissue boxes. When using newspapers, it is important to know what kind of ink is used in the composition of the paper. Some newspaper inks are toxic to the plant and soil. Also remember that cardboard may have been treated with wax, or glue that may not allow for complete biodegradability.